The second mud robot was built considering shipping and quick assembly requirements and features a new mud skin made with clay. The prototype consists of a 48-inch diameter spherical truncated icosahedron, composed by 12 pentagonal and 20 hexagonal plywood-material frames with an interior polycarbonate skin. The hexagonal and pentagonal frames have a series of ‘hooks’ that allow the tension weaving of a round reed layer that serves as substructure for an exterior hand-plastered wet clay skin. Inside the sphere, a large battery powered two-wheeled device built with two gearmotors of 1300 in-lbs peak torque spins at high speed allowing the robot to move and rotate. This prototype allows both remote control applications and an autonomous performance. TZ'IJK.1. Geodesic truncated icosahedron assembled. TZ'IJK.1. Hexagonal and pentagonal wooden frames ready to be assembled. TZ'IJK.1. Weaving basketry reed to support clay skin. Funded by RISD Bridge Grant 2015. 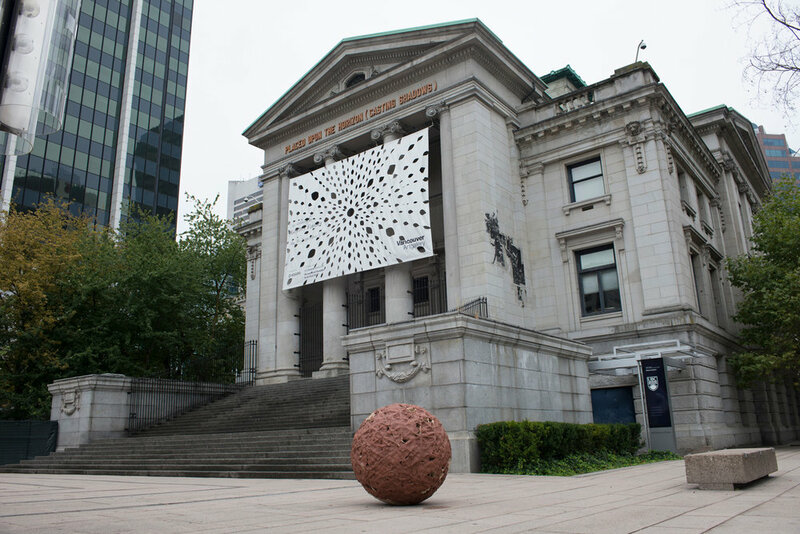 Produced for ISEA at Boca del Lupo and presented at Vancouver National Art Gallery. TZ'IJK.1. Plastering the robot's mud skin with wet clay. TZ'IJK.1. Finished robot installed at the Vancouver Art Gallery. TZ'IJK.1. Viewers interacting with the robot at ISEA 2015.